Posted by admin in Antarctica, current research, volcanology. Just a brief note (for now) on what looks to be a fascinating discovery. Scientists from the British Antarctic Survey have discovered previously unknown underwater volcanoes in Antarctica. During research cruises in RRS James Clark Ross the BAS team discovered no fewer than twelve sub-sea volcanoes, some up to 3 km high, with at least one showing signs of recent activity. The volcanoes were identified in the Southern Ocean near the South Sandwich Islands, using shipboard 3D seafloor mapping technology. Posted by admin in current research, Fuji, Japan, volcanoes, volcanology. ‘Rumbles hint that Mount Fuji is getting angry’, says the rather sensationalized headline that New Scientist has stuck over their report of a new study of Mount Fuji. There’s no suggestion in the original research paper that Fuji is ‘getting angry’, or even slightly annoyed, just a new theorization of the processes that may be causing Fuji’s magmas to become more andesitic to dacitic, thus tending towards a more explosive eruptive style. The paper, ‘Crypto-magma chambers beneath Mt. Fuji’ by Takayuki Kaneko et al (JVGR 2010, in press) notes that Fuji’s eruptive history has been characterized by basaltic activity with occasional explosive eruptions involving andesitic to dacitic lavas. Studies of Fuji’s lavas using air-fall scoria, however, indicate an increase in silica content over time: Kaneko proposes a two-level magma chamber system to account for this, with basaltic magma at the deep level and more silicic magma at the shallower level. The increasing level of silica, suggests Kaneko, ‘could result from the combination of repeated magma mixing between the two end-member magmas and fractional crystallization processes in each magma chamber’. The upward trend of SiO2 … seems to continue to the present. In the last several thousand years, explosive eruptions involving a small volume of andesitic magma were repeated sporadically … Such andesitic or dacitic products have not been found from the older periods of Fuji–Ko-Fuji to the middle stage of Shin-Fuji volcanoes. This may suggest that, in the last several thousand years, the composition of the magma in the shallow chamber has become more SiO2-rich than ever. The New Scientist article says that Kaneko interprets the low-frequency earthquakes detected beneath Fuji in 2000 and 2001 as possible evidence for magma injections into the lower chamber, ‘and adds he would not be surprised if Fuji erupts in the very near future’. That’s the ‘Fuji getting angry’ bit, and it’s stretching things somewhat on the basis of this research. The paper itself simply concludes with the suggestion that ‘Fuji may have entered a stage with the potential for explosive eruptions involving andesitic to dacitic magmas’. Posted by admin in Caribbean, current research, submarine volcanism. 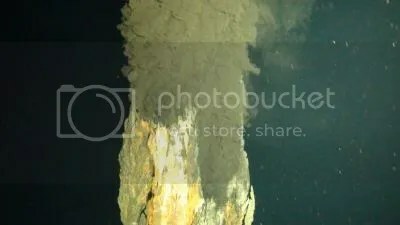 First photograph of the world’s deepest known ‘black smoker’ vent, erupting water hot enough to melt lead, 3.1 miles deep on the ocean floor (National Oceanography Centre). Scientists from the UK’s National Oceanography Centre (NOC) have discovered the deepest volcanic vents so far known, 5000 metres below the surface of the Caribbean Sea. The vents are located in the Cayman Trough in the western Caribbean, which reaches a maximum depth of 7,500 metres. Further research will analyse the geology and geochemistry of the vents and the marine life associated with them. NOC geochemist Dough Connelly, Principal Scientist of the expedition, says: ‘We hope our discovery will yield new insights into biogeochemically important elements in one of the most extreme naturally occurring environments on our planet’. The Cayman Trough expedition, funded by the National Environment Research Council, is based aboard the UK’s new ocean-going research vessel RRS James Cook. For more on the expedition, see our post from August 2008: British scientists to investigate Caribbean deep-sea hydrothermal vents.